The Wizarding World of Harry Potter at Universal Studios Hollywood. You feel that magic in the air? That's not just the buzz around "American Idol" finally going to that great big singing competition in the sky. That magical energy can only come from the knowledge that the Wizarding World of Harry Potter is now open at Universal Studio Hollywood. We've already given you a beginner's guide to making the most out of the park, but now we want to talk to the seasoned witches and wizards. You probably know what to expect at first glance when you enter Hogsmeade, but let us tell you about what you need to give a second glance. 1. If you go to the restroom, listen for the sounds of Moaning Myrtle. 2. When you get to the top of Hogwarts castle, make sure you turn around and take in the mountains in the distance. According to supervising art director Alan Gilmore, the way the mountains are framed is deliberate; guests won't see any of the cityscape but instead feel like they are actually away at Hogwarts. 3. Mention Voldemort to any of the Wizarding World employees and see what happens. Basically, he-who-must-not-be-named still should never be named. 4. Yes, that is a stage you pass by on the way to Hogwarts Castle and yes, a show involving singing frogs will perform for you throughout the day. 5. Careful where you step when walking near The Owl Post. There's (fake) bird poop everywhere! 6. Don't just walk by the sorting hat in Hogwarts castle without listening to his wise words. 7. Be sure to stop and read the animated newspapers as you walk through the line to the Forbidden Journey ride. 8. Stop for a few minutes and listen to the conductor greet people as you walk into the park and past the Hogwarts Express. Somehow a loud, jolly "welcome to Hogsmeade!" is the best way to start your visit. 9. As you walk through the talking portraits corridor in Hogwarts Castle, pay close attention to what the founders are saying. You'll hear them brag about how many points their houses have and you'll probably hear some insults toward Muggles thrown around. 10. Don't miss the shadow of Dobby lurking about while dining in The Three Broomsticks. 11. Harry, Ron and Hermione's lecture to passing guests as they get ready to enter The Forbidden Journey has different variations, in case you want to stick around and hear them all. 12. You can actually send mail at The Owl Post and it will arrive at its destination postmarked from Hogsmeade. 13. Be sure you don't bother any of the mandrakes in Professor Sprout's greenhouse, though there are headphones dangling nearby in case you need them. Guest host Jackie Tranchida and her friend, Josh Fingerhut, explore Universal Studios Hollywood with a special VIP sneak peek at its newest attraction, "The Wizarding World of Harry Potter." 14. The Nimbus 2000, the Nimbus 2001 and the Firebolt are all on display at Dervish and Banges, so don't forget to find them all. 15. Keep your eye peeled for Hagrid's motorbike on display at the Flight of the Hippogriff ride, and you might even hear him explain how to approach those beautiful beasts. 16. Just around the corner from the entrance to the park, you can have your photo taken in a Hogwarts Express compartment, which was taken right from the set of the films. 17. Can you spot all of these store windows throughout the park? 18. We're warning your right now not to get too close to The Monster Book of Monsters that's caged up in Dervish and Banges. And by that we mean do get too close and see what happens! 19. If you listen carefully, you can hear Fang's bark while in line for the Flight of the Hippogriff. 20. The actual costumes from "Harry Potter and the Goblet of Fire" are on display at Gladrags Wizardwear. 21. You can see (and hear) a Howler for yourself if you are in the right spot around The Owl Post. 22. Pay your respect to the Fat Lady as you wind your way through Hogwarts Castle. She probably has a thing or two to say to you. 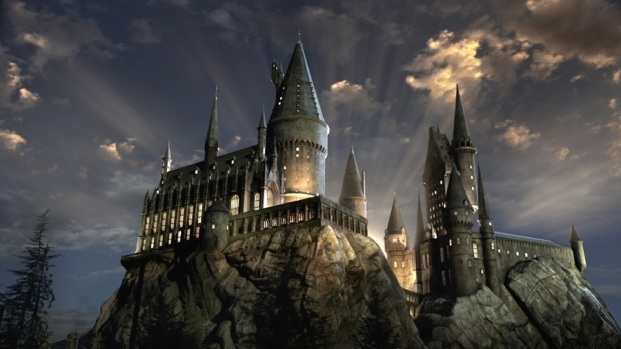 The Wizarding World of Harry Potter opens at Universal Studios Hollywood on April 7.